There seems to be some confusion regarding these two very dissimilar cookies with very similar names, but oh, what a difference an O makes. Let’s get the pronunciations out of the way first: macaroon rhymes with “black balloon” and if you honk the final syllable of macaron through your nez, you’ll nail the proper French pronunciation of that one. Were the two cookies once a single biscuit that bifurcated due to some culinary tectonic shift? In search of the proto-macaroon, I consulted my copy of Larousse Gastronomique. There was a macaroon (their spelling) based on almond meal that has been made in a French monastery in Cormery since 791 (no, that’s not a typo) that’s not too different from one half of today’s macaron. I say half because the definition of a French macaron is that it comprises two almond flour cookies joined back to back by a sticky filling like jam or ganache. The seemingly infinite variety of flavors (more about that later) derives from the filling alone, and the coloring is just that: coloring. In my experience, they require the patience of a saint (or perhaps a monk) to produce competently. Macaroons, in contrast, are quintessentially American; a mounded cookie consisting of shredded coconut, sugar, egg whites and sometimes sweetened condensed milk that in its rudimentary form is so uncomplicated as to make it a good candidate for a child’s first baking experience. Etymologically, the word “macaron” makes a brief appearance in the writing of Rabelais in 1552. It stems from the Italian word “maccherone” meaning a “fine paste” (consider how the combined ingredients appear before baking) and yes, the word macaroni shares the same root (consider pasta/paste while you’re at it). Subsequently, it shows up in an English language recipe from 1611 that spells it “macaroon” and identifies the word as having been derived from the French “macaron”. So the words diverge centuries before the cookies do and the conflation conflagration begins. The Renaissance version of the cookie itself was pretty well defined as a “small, round cookie, crunchy outside and soft inside, made with ground almonds, sugar and beaten egg whites” folded together, essentially what we think of as Italian amaretti. 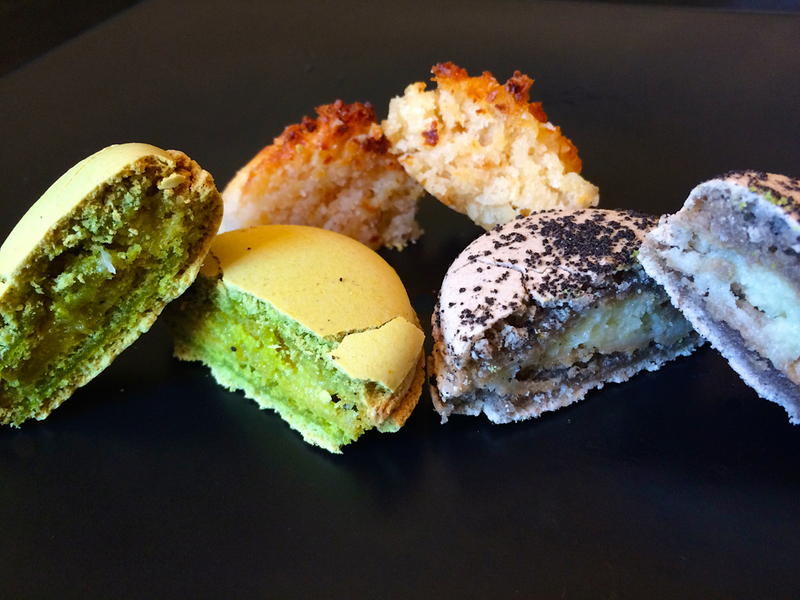 And so these macarons/macaroons prevailed for many years – there’s a recipe in Martha Washington’s Booke of Cookery – until just before the 20th century when two events occurred that altered the course of cookie history. At that time, coconut palms were introduced to and cultivated in Florida and their fruit became the darling of the American kitchen. In 1871, Esther Levy published the first Jewish cookbook; it featured a recipe for macaroons in which grated coconut replaced the traditional almond flour. 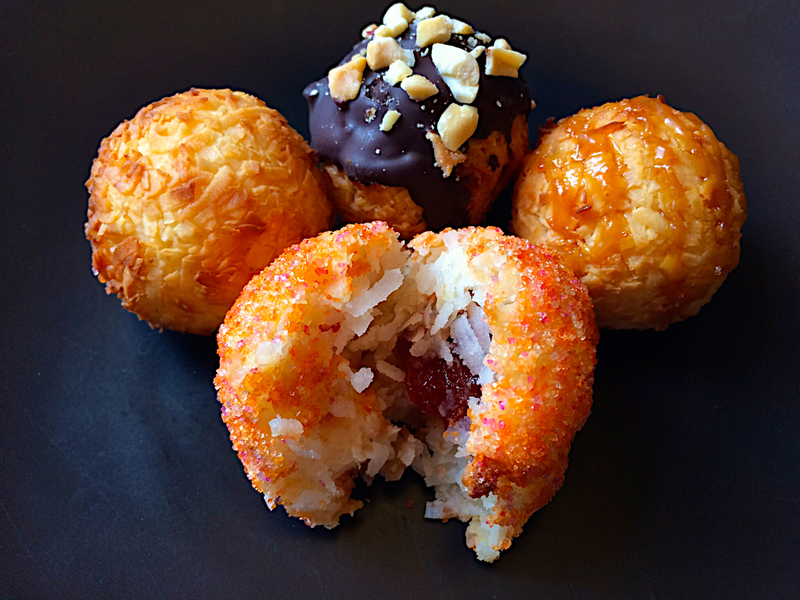 Because the dietary restrictions of the Jewish holiday Passover prohibit the consumption of leavened baked goods, coconut macaroons handily filled the dessert bill and they caught on. A few years later, the Parisian bakery and tea salon, Ladurée, began selling almond flour macarons in pairs, flat sides back to back, with sweet fillings like ganache to hold them together. So at that juncture, we formally have two different cookies, each with its own proper name. Macarons come in several sizes but are always paired and share the classical puck-like shape. The sheer number of flavors to be found borders on the ridiculous and precludes any attempt at a comprehensive list, but you’ll see fruit flavors like cherry, banana, peach, pineapple, pomegranate, honeydew, coconut, papaya, passionfruit – actually pretty much every fruit you can name; what I’ll call “roasted bean” like coffee, latte, mocha, dark chocolate, milk chocolate, white chocolate; nuts like walnut, almond, pistachio; boozy specimens like Grand Marnier, Jack Daniels, Baileys Irish Cream, mojito; other dessert interlopers like crème brûlée, salted caramel, praline, Nutella, cotton candy, Oreo cookie (a cookie that’s designed to taste like another cookie? ); Asian influences like pandan, durian, candied ginger, thai tea, red bean, mung bean, matcha tea, taro; floral/herbal flavors like lavender, mint, rose; and just plain brazen contenders like fois gras, wasabi, maple syrup & bacon, cheeseburger, bubblegum, Cheetos, and Vegemite. Mon dieu! Then there are the double combinations like raspberry almond, blueberry cheesecake, lavender honey, white chocolate mint, strawberry kiwi, rhubarb cilantro and the like, not to mention triples like s’mores – you mathletes out there could calculate the permutations and combinations if only the flavor list weren’t infinitely long. Not to be left out, popular brands of Passover macaroons including Manischewitz, Streit’s and Gefen have entered the fray but with somewhat less rebellious flavors like almond, chocolate chip hazelnut, red velvet, cookies & creme, pistachio orange, carrot cake, cappuccino, toffee crunch, chocolate mint, and purely coconut – again, a list that’s far from exhaustive. 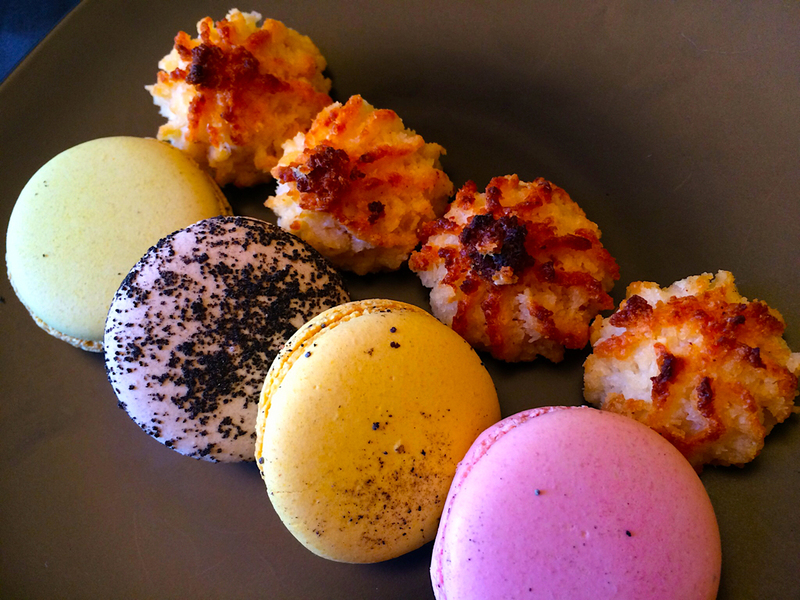 I kind of like the fact that you can get almond macaroons and coconut macarons. Seems right somehow. Beyond the popular brands of macaroons often sold in cans, I’m also seeing some serious bespoke examples at upscale bakeries. These second generation macaroons, if you will, turned up at last year’s incredible World’s Fare in Queens and were crafted by Danny Macaroons: original coconut, peanut butter chocolate, salted caramel, and pineapple-guava filled. Incidentally, the 2nd Annual World’s Fare will happen at Citi Field, 123-01 Roosevelt Avenue, Queens, NY on May 18-19, 2019. So armed with this fresh batch of information about the difference between macarons and macaroons, you can officially consider yourself one smart cookie. If you’re anything like me, you’re a fan of both! This entry was posted in Stories, Sweets and tagged French, Jewish by Rich. Bookmark the permalink.